On Wednesday the 12th of December, trading on the euro closed up. Its rise was brought about by news from Italy as well as the strengthening of the pound. The Italian government is willing to agree to a budget deficit target of 2%, while Theresa May won a vote of no confidence among Conservative MPs. 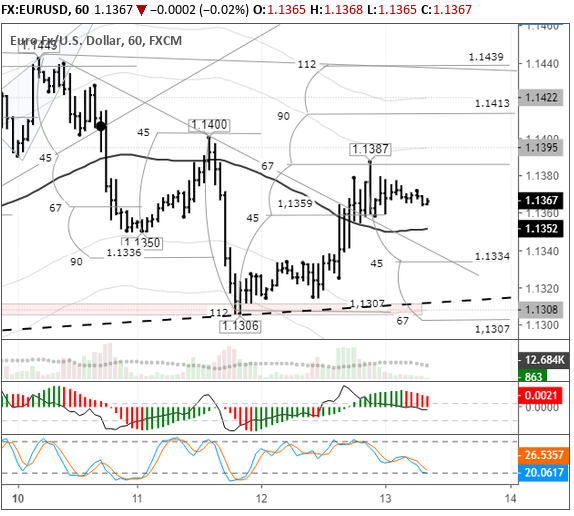 The euro rose to 1.1387 and is currently undergoing a correction. 11:30 Switzerland: SNB interest rate decision. 12:00 Switzerland: SNB press conference. 12:15 Switzerland: producer and import prices (Nov). 15:45 Eurozone: ECB interest rate decision. 16:30 Eurozone: ECB monetary policy statement and press conference. 16:30 Canada: new housing price index (Oct). 16:30 US: import price index (Nov), initial jobless claims (7 Dec). My expectations of a rise on the EURUSD pair yesterday were proven correct. On the back of a weaker dollar and stronger euro crosses, the bulls managed to break through the trend line at 1.1443. I’ve decided not to make a forecast today because Mario Draghi has a press conference at 16:30 (GMT+3). This will have a profound effect on currency pairs involving the euro, so there’s no point making any predictions. Draghi may strengthen the euro at the beginning of the press conference, thereby triggering the bears’ stop levels, only to bring it down later. On the other hand, he could set up his speech to initially sink the euro to trigger pending long orders, and then send the euro skyrocketing. The range for potential fluctuations is 1.1315 – 1.1440.